My first issue right off the bat with The Giant had to be the story. Now I feel like I should note that I love the world and most of the characters within it but I was really disappointed once it became obvious this was more a companion tale than an outright sequel to the main story. Had this been marketed as a companion maybe I'd feel differently but as far as I can tell this is supposed to be in the main line and help bridge the gap between Book 3 The Burnouts and the yet announced Book 5 in the series. Which brings me to issue Number 2. Did we really need a full length novel following Gonzalo? I'm sure many will disagree with me on this but I don't believe so. The Giant really felt like filler vs. serving a purpose to further along the much more complicated and larger plot. I say this because we still don't know many details about the epidemic. You know, the whole point of the series in the first place. Instead Gonzalo who is a fascinating character I should point out spends most of the story obsessing over a girl who he barely had time to form a real relationship with in the first place. In the grand scheme of things their relationship was just that of two kids crushing on each other because they were both available and damaged by the events at the school vs. having a deeply formed unbreakable bond like that of say Hermione and Ron from The Harry Potter series or Katniss & Gale or I suppose Peta from The Hunger Games. Both of those couples suffered intensely but still managed to make their relationships feel genuine. Now despite my many issues to the contrary The Giant wasn't all bad. First off, I appreciated that the Author at least mentioned characters from the first books. Sure, I'd rather have another full book following The Loners but at least they were mentioned as still being around and trying to resolve their situation now that they are "Free". Secondly, I really was happy to see some of the main scenes from the first two books from an outsiders perspective. The moment The Loners unite is a big one and it's cool seeing Gonzalo's part in that through his eyes. Lastly, even though I hated watching Gonzalo's obsession with Sasha it did at least allow us to see more of the world inside the quarantine zone. His travels also establish that the more things change the more they stay the same. I hate wrapping up any review on a sour note but I truly wish the Author chose to continue on with the main story and characters outside of Quarantine instead of writing a full length novel following one of the many side characters throughout the series. Did this character have a story to tell? Absolutely! Did it need a full novel to tell it? No, it did not. 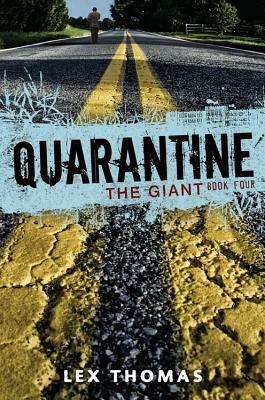 With that being said, I'll be rating Quarantine: The Giants by Lex Thomas ★★★. *Copy reviewed won through publisher giveaway. All opinions are my own and I was not compensated in any which way for providing them. Lex Thomas is the pen name for the writing team of Lex Hrabe and Thomas Voorhies. Their first novel, QUARANTINE: THE LONERS, earned a starred review from Booklist, and Huffington Post Books praised it, saying, "You will not be able to put this book down." Lex and Thomas met in a writers' group in Los Angeles. Their friendship developed as they tried to blow each other's minds with clips from bizarre movies. In 2005, they became a screenwriting team, and found that writing with a friend is much more fun than doing it alone. If you would like to read my review of Quarantine: The Saints you may do so by clicking here! If you would like to read my review of Quarantine: The Burnout you may do so by clicking here! A little Bit Zombie is a zombie movie with some comedy factor but Dead Heads is a real horror film with great acting. My favorite Zombie movie is 28 Weeks Later and Zombie-land that I have watch several times on 123movies for free . I also agree about your opinion regarding Stalled, it is worth watching for both comedy and horror lovers. I want to talk about the latest version of "Andre the Giant". I've watched its old version many times in cinema and via fmovies online - a steam movies site better than 123movies but I think it is the time of new version with latest acting cast and crew. What do you say?